Something similar: Back in the 1940's they thought about putting a depressed Central Artery down the middle of a drained Fort Point Channel. Last edited by Charlie_mta; 03-22-2019 at 07:48 PM. You also *must* hit Kenmore in order to go anywhere further, because being able to bang a right from Brookline Ave. under the Pike/B&A is how any Allston or D-Line swallowing trajectory becomes possible. But note well: Charles-Kenmore *only* happens as a Storrow trade-in, and *only* happens as a funded project within the Storrow teardown project area. Any further appendages are completely separate expansion projects in a completely separate project area that can only be mounted AFTER Charles-Kenmore is completely committed (i.e. not as Phase I-Phase II). That's how the funding process would have to work as a transit trade-in: keyed to same project area. Extend the Red Line underneath 2? Alewife is such a cluster that extending it out in any direction would be very helpful and under 2 might be more politically doable than, say, Burlington. Obviously would not be cheap. To Lake Street, Arlington? Arlington Center? Route 2 in that area is very overbuilt for the amount of traffic that it gets. You could easily just get rid of some lanes and put the Red Line in the medium, or alongside. Would be a lot cheaper than building underground. If you're going to dig underground, extending the Red Line to Watertown/Waltham would make more sense. Sure Arlington Center is dense, but Lexington, Belmont, and the northern part of Waltham aren't really dense enough for rapid transit service. Storrow is 6 lanes wide from under the Longfellow to Kenmore. That's crazy. 4 would suffice, particularly if all the "highway merge" ramps were replaced with a traffic light or two. And by 4 lanes I mean only 1 thru lane in each direction, with "the other" lane (each way) being either a turn or entry lane. It's pretty clearly provisioned for one and only one extension routing. Angling anywhere to the south or west nukes the entirety of the garage. 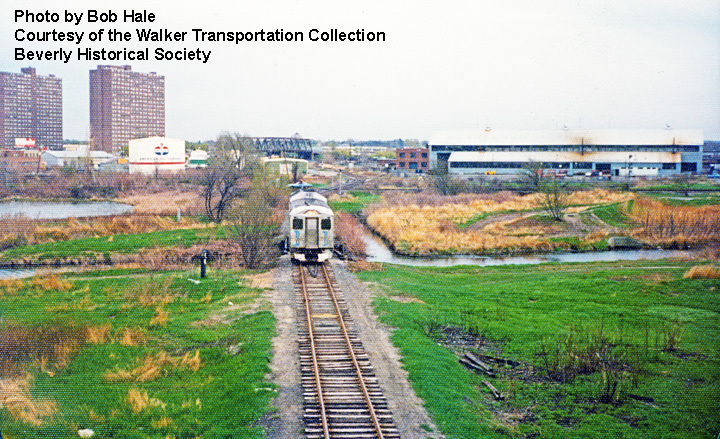 And 2 is no-go unless the station were rebuild across the street because in '85 the tunnel construction had to stay centered on the ex- Lexington Branch roadbed to keep from impaling itself on the Alewife Reservation wetlands that surround it on all sides. Arlington Heights is not a bad destination at all. It's probably more doable than it was 35 years ago because Arlington has developed non-buyer's remorse for not running with back in the day, staging better bus frequencies out of AH terminal can serve the NW quadrant of 128 worlds better than anything available today, and it won't negatively impact the Minuteman. You would need about 35 feet for the tunnel width, which would go from the Back St. retaining wall all the way to the lane stripe for the EB left lane. And that's a minimum. This is going to be a shallow-depth tunnel averaging 4-6 feet lower than the Back St. wall, with the roof just having dirt poured on it for landscaping...almost like a super-extended BU Beach (this compared to regular cut-and-cover which goes 20-50 ft. below street level). At Back St.'s lowest point approaching where it meets up with the Clarendon exit ramp this means the tunnel roof will basically be at pavement level up to 2-3 ft. below pavement level. It will need waterproofing given proximity to the Lagoon and widest point of Charles Basin. Saving grace of being such a shallow, almost surface-straddling tunnel is that the flood protection can be cheap and self-regulating in the form of building up the river-facing tunnel wall a few feet higher than the roof to act as a passive barrier for the Back Bay. That will, however, mean that you'll need more thickness to build up the wall...and thus it's probably going to exceed 35 ft. by a wide enough margin to infringe on the remaining EB left-lane real estate and make doing 2 carriageways of 2 lanes each impossible without the road carving up an enlarged strip of Esplanade than it does today. You will always, because of the WB carriageway's width, have the ability to do a "Storrow Lane" speed-limited undivided park access road spanning where Soldiers Field Rd. drops off at Charlesgate or Mass Ave. and Embankment Rd. picks up at Charles Circle (i.e. the two segments that can't be replaced by free movements on the Pike instead). But functionally speaking it requires a commitment to tear down the parkway at its midsection since the measurements are not all that favorable for trying to cram everything in. Looks like the line could still curve left for a route up the Route 2 median. It might need a temporary infringement for the tunnel construction onto the ballfield north of Rte 2, but a decent curve could be fitted in. It would then surface in the middle of Route 2 just east of Lake Street. I'm sure, though, the Nimbys along route 2 would oppose it. And the grade up "Mile Hill" may be prohibitive. This is why you can't. . . This 1976 photo was taken from the sidewalk on the Route 2 overpass. The bridge over the brook that Budd RDC is passing over is where the 2 exit ramp bridge and adjacent arched Minuteman bridge are now. The giant Amoco gas tank is Alewife Station...few dozen feet inside of here. Note how substantial a causeway the tracks are running on through these wetlands. That 19th century hard-pack roadbed is what allowed them to dig the tunnel in the mid-1980's without getting ensnared in wetlands hell. And that was back when the whole Alewife watershed was still an environmental disaster area; it's clean now. On the tunnel map in my last post, the RL obviously originates from the Fitchburg Cutoff ROW on what's now the Community Path. But why did they plunk Alewife in a place where the tunnel was forced to make that distended 'scoop' move? Wouldn't it have been more logical to put the station across the street opposite the rotary, in front of the GCP factory? Wouldn't that have afforded cleaner future routing options? Reference again the Amoco tank from the '76 photo. It was a remediated petroleum site: dirty-dirty dirt, the kind that's great to be hauling out when driving deep pilings for a large parking garage. They went down there via the post-industrial wasteland that was next to Russell Field and Jerry's Pit, used the Amoco site's dirty-dirt remediation to do the entirety of the curving onto the Lexington Branch alignment, and then capped it with the garage. Thorndike Field existed back then, though it was kind of a dump owing to having a (once double-track) railroad and a thick wall of trees splitting it off from Magnolia Park. However, the wetlands spanning the back of Thorndike to the Lake St. exit on 2 still had a large marsh on it (now completely obscured in overgrown reeds). Those are the wetlands that prevent a turn off the old Lexington Branch causeway's terra firma through Thorndike and onto the 2 alignment. Once you hit the tree line at the field, you're in protected swampland. The curve can't be so tight it's performance-killing (remember: you've already passed through Harvard curve and can't sustain headways by having anything close to another), and so there's no way to make the turn clear of the Alewife Brook wetlands that won't end up plowing through a substantial cut of the swamp next to 2. FWIW...the *was* another rail line here in addition to the Fitchburg Line, Lexington Branch, and Fitchburg Cutoff. The Fitchburg Line had a spur to Spy Pond for the icehouse that used to be there (Fresh Pond also had such an icehouse spur off the Watertown Branch). It branched off a few feet before the mainline and Cutoff merged (i.e. where the Fitchburg Line goes from curved to arrow-straight behind Mooney St.), crossed the brook here, followed the west bend of Acorn Park Dr. and went to Lake St. right where it 'elbows' at the 2 exit. Spur then split into a siding that went up present-day Spy Pond Pkwy to Kelwyn Manor Park. Main spur split Spy Pond and Little Pond to what's now Albert Ave., stopping at the icehouse on the lake. Lake spurs were kaput by the 1910's because refrigeration was common, but the portion that served freight to Acorn Park lasted until end of WWII. Western extension (circa 1971) of Acorn Park Dr. from the curve to Route 2 is built on the old railbed. So is Route 2 itself (well...at least the original narrow 4-lane parkway) where it splits between the two ponds. Why did all that modern infrastructure have an easy time getting built while across the way is still reed-choked no-man's land? The common theme around Alewife: contaminated ex-industrial crapola remade at Acorn Park, and another recycled rail causeway built high and packed hard in the 19th century now hosting modern transportation. This is a pervasive issue you hit re: where you can and can't feasibly go when civil engineering anything around Alewife. Also, Route 2 completely misses any kind of density. (Not surprising - it was built where land could be acquired.) There's literally nothing but low-density suburbs all the way out to 128. Versus on the Lexington Branch you're hitting Arlington Center and Arlington Heights (and Lexington on a further extension) which is basically the only real density in that entire quadrant. Well if we're talking about crazy transit pitches, branching the red line out with one to Lexington and the other to Brandeis using the Fitchburg Line right of way. Branching at porter would be rough on Davis and alewife. On many mornings, trains depart porter (inbound) pretty full. Cutting headway upstream in half would be brutal. Especially if you add a bunch more stops in Arlington and Lexington. Maybe with enough signal enhancements to reduce headways it would be ok. I think 15 minute emu service to Brandeis would be sufficient for a good long time. It wouldn't, though, because Harvard curve already sets the headway limiter for all of the Red Line. There's no physically possible way to branch out without gouging headways Porter-outbound. They had a choice in the 70's: (1) try deep-boring the new Harvard Station for a wider/gentler curve and dealing with tricky impacts slipping under Harvard Yard with god knows what 400-year-old artifacts might be buried all around there; or, (2) cut-and-cover the Square at known-knowns and cost savings but knowing that may be a future limitation. They chose cut-and-cover. And it can't be undone now by re- deep-boring the Square and destroying a portion of the 1979 tunnel, given how much new construction is now packed to the rafters all around it. Belmont/Waltham aren't yet at rapid transit levels of utilization, and haven't yet been rejuvenated by :15 Urban Rail headways which the branchless/freightless inner Fitchburg Line can most definitely handle. It was the only northside mainline that never had any rapid transit proposal attached to it, going back to 1945. Today it'll probably still be the very last one needing it. If you do need it at some point, Fitchburg Line ex- quad-track continues from Union/Porter through Belmont Station because of the former West Cambridge freight yard leads. It's tri-track beyond there, save for the 1955 grade separation of Waverly into the trench which would have to be widened. Where the Central Mass ROW pulls off the remainder to 128 is historically double-track. However, the Central Mass could be reactivated to re-route the Fitchburg Line through North Waltham while rapid transit hugs Waltham Ctr. + Brandeis...with both ROW's re-joining at the 128 superstation. Because some of the grade crossings are such hard eliminations, you're probably looking at a Green Line branch so LRT can handle whichever crossings can't be practically eliminated. Operationally it would work as a branch or extension off the Union Branch, since if the Urban Ring NE quadrant is attached service would be able to be fileted between Sullivan, etc. and Lechmere/subway...keeping the load on the subway north end well-contained. But I would not rate this poke past Porter anywhere near as high priority as Watertown Branch LRT because the density is just not the same...and the H2O Branch itself doesn't exactly rate all that high on a priority list right this second. So this is only useful for knowing you can very feasibly do it on LRT (not HRT) if ever needed...not that it's any sort of burning need to explore when Urban Rail is the first reach.